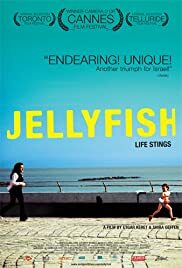 Jellyfish, for all its generous spirit and life-affirming moments, doesn't shy away from the little absurdities that inundates everyday existence. Even in the same frame there is a glow amid the isolation and personal embitterment. An unbearable lightness that cannot help but expose the chalky hands of fate. Those who have ever asked in exhaustion, "why me?" can find a lot to love about this little Israeli import. The film is told through a hyperlink narrative. Though its themes are much more ethereal than those of Traffic (2000) or New Year's Eve (2011). That and the narratives don't so much interlock as they migrate towards and away from each other. We follow the progression of three struggling women adrift in noisy Tel Aviv, vexing over life's ennui. While doing so, the women cross paths, barely glimpsing each other's existential angst. The first women is the young Batya (Adler). She's a sullen, ineffectual banquet hall waitress, struggling to keep her job and an apartment that's slowly falling apart. Meanwhile her divorced, working professional parents all but ignore the warning signs of her mounting depression, brought about when her boyfriend leaves her. Unexpectedly, while trying to relax at the beach, a mute child (Leidman), freckled and wet, appears like a vision. She tries to find out to whom the child belongs to, to no avail. The second woman of our story is newlywed Keren (Knoller) whose Caribbean honeymoon has been botched by a faulty bathroom stall. Her ankle now broken, she tries to make the best of a worsening situation, by following her husband Michael (Sandler) to an aging sea side hotel in town. It is there that Michael meets an attractive writer (Albeck) whose femme fatale allure threatens the strength of their new marriage. The third woman is a Filipino caretaker named Joy (De LaTorre). Joy tries and repeatedly fails to connect with her employer (Harifai) whose tersely shouts in Hebrew and German, neither of which Joy speaks. She pines to have her son with her, vainly communicating with him through short collect calls and promises of gifts and visits. A common motif that permeates all three stories is that of water. Joy is mesmerized by a toy boat she wants to get her son, while Keren complains that they're a short walk from the beach yet can't see the sea. She also begins to write a poem, wistfully equating her feelings of isolation to that of a ship in a glass. Finally there's Batya whose discovery of the child on the beach, unlocks dormant traumas that include her parents arguing as the young Batya drifts out to sea in an inflatable tube. Could the water represent transition and the possibility of renewal? Perhaps yes, perhaps not. The magical realism that seeps into the lacquered grooves of this film brings with it occasionally irksome subjectivity that's nearly impossible to decode. This film doesn't hold your hand but rather lets you explore the serendipity of Jellyfish's world through the eyes of three women who are dulled by constant misfortune. Some may find their woes pedestrian and cloying, especially considering the film is Israeli and completely ignores political realities. Yet choosing characters that exhibit the incessant, hard to describe hum of anxiety and depression gives the film both a timelessness and a universality. In the end, there's solace in the arms of others; a lesson that those quietly suffering would be wise to heed. While occasionally stodgy, Jellyfish doesn't wear out its welcome, finding just enough pulp in the stories while reveling in some art- house expressions and compositions. The subjectivity of its framework works in its favor to deliver a film that can be read in many ways, including being a frank and effective meditation on depression. 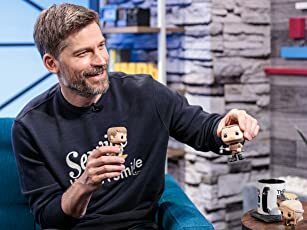 It does all this without being showy or overly pretentious but instead lingering on the deflation of character expectations, before rewarding its audience with small but meaningful victories.